(186 x 258 mm) 8.3 x 11.7 in. A4 Mounted 7.3 x 10.2 in. THANGKA 16.9 x 24 in. (428 x 607 mm) 16.9 x 24 in. NOTE: The original unbrocaded thangka of this unique composition by Dorje is for sale, Priced at GBP £1,150.00. This composition depicts the deity assembly for the "Four Session Guru Yoga Practice", which was originally instigated by the 8th Karmapa Mikyo Dorje (1507-1554). This is a principal and concise devotional Guru Yoga practice of the Karma Kagyu Tradition that is widely performed to help cultivate the realization of Mahamudra. Through visualization the practitioner generates himself or herself in the form of the red wisdom dakini, who appears at the bottom centre of this composition. Appearing amidst a blazing mass of light, she is ruby-red in colour and stands in dancing bow-and-arrow posture upon a golden sun disc and lotus. She is beautiful and youthful like a sixteen-year-old, with three space-gazing eyes, firm breasts, and her long tresses of blue-black hair hang freely down her back. Naked and unadorned, she wears only a garland of red flowers, and holds aloft a curved knife in her right hand, and a skull-cup filled with the nectar of immortality in her left hand. Above her is the visualized heruka or 'blood-drinking' aspect of Jetsun Mikyo Dorje, who is semi-wrathful and blue-black in colour with three eyes, two arms, and is surrounded by an aura of blazing red awareness fire. In alidha posture he leans towards the left, with his two feet resting upon his golden sun disc and lotus. He wears a tiger-skin loincloth, a flayed elephant-skin across his shoulders and back, a long billowing green silk scarf, a five-skull crown, gold ornaments, and the six bone ornaments. With his two hands joined he makes the dharmodaya-mudra at the crown of his head. Enthroned in vajra-posture upon a white moon-disc and pink lotus at the centre of this composition is the 8th Karmapa Mikyo Dorje, who wears the three red robes of a bhikshu or monk and the Karmapa's famous ‘Black Hat or Vajra Crown’, which was originally presented to the 5th Karmapa, Dezhin Shegpa (1384-1415), by Yung Lo, the Chinese Emperor of the Ming Dynasty. With his right arm crossed over his left arm in vajra-humkara-mudra Mikyo Dorje holds his two method and wisdom attributes of a five-pointed golden vajra and a ritual silver bell, as it gazes into space with a unified expression of bliss and emptiness. Encircling Mikyo Dorje’s radiant blue and golden aura is a luminous sphere of multi-coloured rainbow light, within which blissfully dance a circle of seven wisdom dakinis. These beautiful dakinis are naked and unadorned, each has three eyes, long black hair locks, and hold the attributes of a sounding damaru or pellet-drum in their right hands, and a skull-cup filled with the nectar of immortality in their left hands. The light of these seven dakinis purify and eliminate all illnesses, malefic influences and defilements. 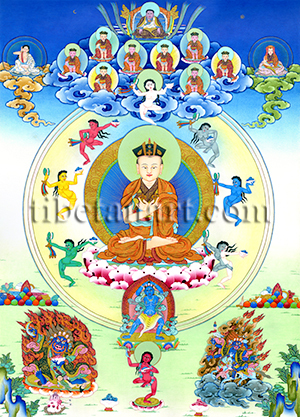 Clockwise from the lower left they are: green Karma Yogini; yellow Ratna Dakini; red Padma Dakini; white Buddha Dakini (top); black Samaya Dakini: blue Vajra Dakini, and the body of the seventh dakini is pied, with her left side white and her right side black or smoky grey. ‘Filling all space’ amidst the blue clouds at the top of this composition are eight identical manifestations of Mikyo Dorje, four of which have pink complexions, while the other four are flesh-coloured. They all arise from the syllables AH, HO, HUM and OM, and sit with the palms of their hands and the soles of their feet facing forward as they bestow their blessings upon practitioners. As blessings the outline palms and soles of great Tibetan masters are sometimes painted in gold on the four corners of a thangka, or printed and outlined in ink on the back cotton surface of a thangka. Amidst rainbows at the top centre is Marpa (1012-97), who founded the Kagyu Tradition in Tibet. And enthroned upon clouds in the upper left and right are Marpa's disciple Milarepa (1052-1135), and Gampopa (1079-1153). In the bottom left and right corners are the two great male and female protector deities of the Karma Kagyu tradition, Dorje Bernagchen and Rangjung Gyalmo. Dorje Bernagchen, the ‘Great Black Cloaked Vajra’ is a dwarf form of Mahakala, who is black in colour with a large and extremely wrathful ‘cloud-shaped’ face, three round red eyes, a gaping mouth, four sharp fangs, and upward blazing head and facial hair. He is adorned with ornaments of gold and filigree bone, a serpent necklace, a five-skull crown, a garland of fifty freshly severed heads, and a garland of small red sandalwood clubs. As garments he wears a tiger-skin loincloth and a nine folded robe of billowing black silk, which is embroidered with golden designs of various weapons. With his left hand he holds aloft a skull-cup containing the fresh blood and warm heart of an enemy, and with his right hand he wields aloft a large crescent-shaped chopper with a fiery blade. Rangjung Gyalmo, the ‘Self-Created Queen’, sits side-saddle upon her blue ‘iron’ mule, as she rides across an ocean of swirling blood and fat, and amidst a maelstrom of storm clouds, wind, smoke and fire. The mule’s saddle-blanket is fashioned from the flayed skin of a cannibal-demon, and its bridle and reins are made from poisonous serpents. A cannibal demon’s skull forms part of her saddle, with a skin-sack full diseases and a pair of black and white dice hanging from it. Sri Devi Rangjung Gyalmo is extremely fierce and blue-back in colour, with four arms, three round red eyes, a five-skull crown, and she wears a robe of embroidered black silk and a tiger-skin or ‘hair’ loincloth. A peacock feather parasol and crescent moon crown her upward-streaming hair-locks, while a small white lion and a snake leap out from her right and left ears. With her right hands she holds a vajra-marked iron kila or dagger, and a skull-topped iron trident. And with her left hands she holds a silver divination mirror and a serpent-noose. Offerings of jewels and the ‘eight auspicious substances’ appear above Dorje Bernagchen, with jewels and chakravartin emblems appearing above Rangjung Gyalmo. And at the bottom are the traditional wrathful offerings of two skull-cups containing swirling blue nectar and red blood, and an upturned skull with its scalp containing the five sense organs (heart, nose, eyes, ears and tongue).